At Comiket 83 from December 29th to 31st, the Ib Calendar 2013 will be sold! This wonderful calendar contains the winning illustrations from the Ib Festival held on Pixiv in the summer. If you're going to Comiket, please check it out. But from the 29th to the 31st... That's literally the end of the year. How many can make it at such a busy time...? I'm terribly sorry, but it's looking like it'll be next year. I apologize. I know it's rather late, but this is by far the biggest update yet (er, there's only been two...), so please wait patiently. I may actually end up recruiting some test players for this, actually. I would like to complete it as much on my own power as possible, but if I come to think "Ahh, I can't do it! ", then I'll look for help. 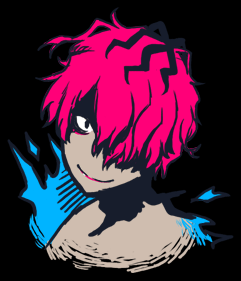 Garry would have been nice with pink hair, but I scrapped it because he stood out more than the protagonist and it didn't fit the mood at all.